November 16, 2015 – Inside the clean room at NASA’s Goddard Space Flight Center in Greenbelt, Maryland, engineers recently completed two deployments for the James Webb Space Telescope’s “wings” or side portions of the backplane structure that fold up. 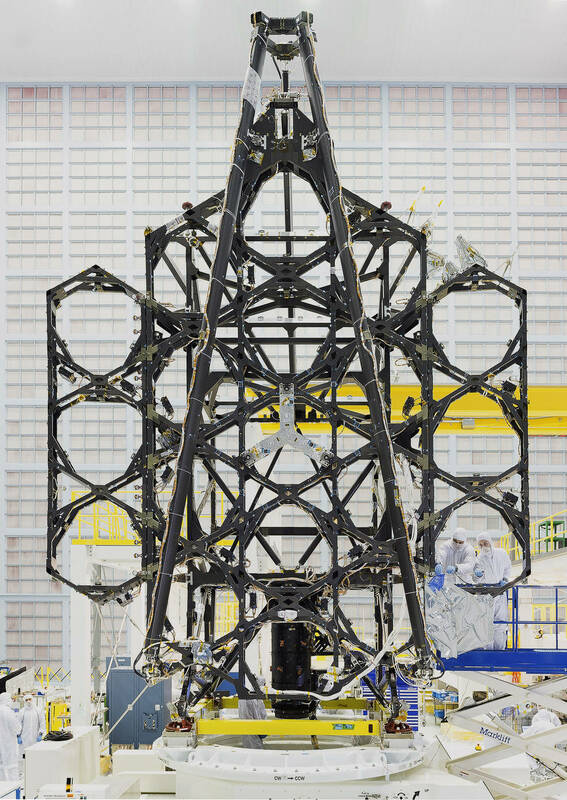 The wings and telescope structure are essential because they make up the telescope’s carbon fiber framework which will hold all 18 of the telescope’s mirrors and the tower for the primary mirror. Once on orbit, 18 hexagonal mirror segments designed by Ball Aerospace of Boulder, Colorado will work together as one 21.3-foot (6.5-meter) primary mirror, the largest mirror ever flown in space and the first to deploy in space. Leading up to this test, engineers lined the telescope structure with cables. In space, these cables will enable the telescope to open up and will provide electrical signals to the active mirror segments. During the wing test, however, the engineers needed to make sure the cables did not block the deployment, and so the team arranged the cables carefully. The James Webb Space telescope, once fully assembled, will be bigger than any rocket that can launch the telescope into space. So the engineering team designed the telescope to fold like origami to fit inside its Ariane 5 rocket. Once launched, Webb will be shipped out to its destination one million miles out in space. Webb telescope’s images will reveal the first galaxies forming approximately 13.5 billion years ago. The telescope will also see through interstellar dust clouds to capture stars and planets forming in our own galaxy. At the telescope’s final destination in space, one million miles away from Earth, it will operate at incredibly cold temperatures of -387 degrees Fahrenheit, or 40 Kelvin. This is 260 degrees Fahrenheit colder than any place on the Earth’s surface has ever been. In addition to 20 optical assemblies, Ball is developing the cryogenic electronics used to align and phase the optics in flight; cryogenic radiator assemblies; wavefront sensing & control software to determine the motions necessary to phase the telescope in flight; and optical system engineering support.